Cancer made me a better mum is the title I was given and asked if I wanted to write my thoughts towards it. I found it so hard at first to get my head around this tile but as it was for the Daily Express I thought it would be a fabulous opportunity so I really tried hard. 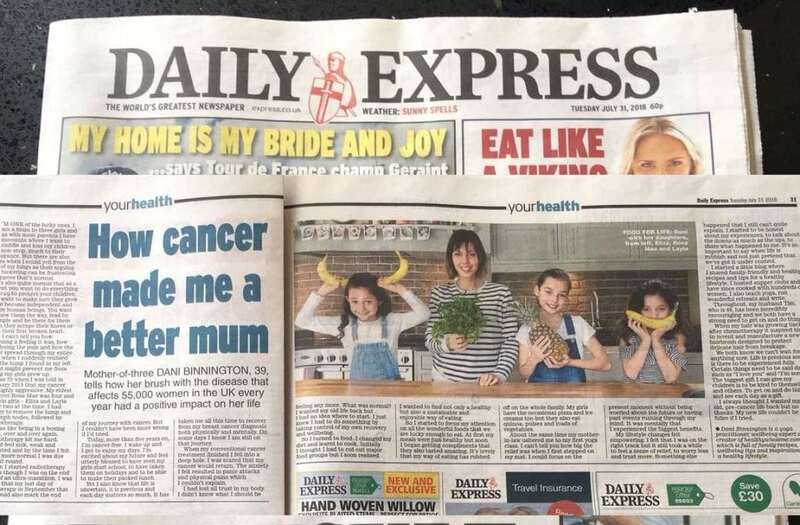 Cancer made me a better mum. Really? My initial difficulties lay in the fact that at first I didn’t think that cancer actually did make me a better mum. I am no more patient now than then. And I can still shout at my three children, and then feel bad about it. But I soon realised that that’s not what it is all about. This whole parenting malarkey can be such a rollercoaster ride of emotions. It’s definitely trial and error and once I think I’m at my wit’s end, something changes and we move forward, quite naturally. Parenting is just as multi facetted as the most beautifully cut diamond in the world. It’s the balance between teaching my children enough maths to achieve what they want and enough self love and self respect to do so emotionally healthily. Below is the copy to the full article, let me know what you think! “I’m one of the lucky ones. I am a mum to three girls and like most parents, I have moments where I just want to cuddle and kiss my children non stop (much to their annoyance) and I have moments when I could yell from the top of my lungs as their arguing and bickering can be so frustrating. I suppose that’s normal. It’s also quite normal that as a parent you want to do everything you can to protect your children. You want to make sure they grow up to become independent and happy human beings. We want to show them the way, lead in good example and to be there for them when they first have a broken heart. I can’t tell you how sickening a feeling it was, how paralysing the pain and how the terror rippled through my entire body when I suddenly realised that the lump in my left breast might prevent me from seeing my girls grow up. I was 33 when I was told that my cancer was highly aggressive. My eldest daughter was 4 and my twin girls were just 2. After surgery to remove my lump and lymph nodes followed chemotherapy. It was like getting into a boxing fight. Over and over again. Chemo would hit me hard, I would feel sick, weak and exhausted and by the time I would feel a little more normal I was due my next round. Wham. Here we go again. When I started radiotherapy I felt as if I was on my end spurt of my very own ultra marathon. I was hoping that my last day of radiotherapy would also mark the end with my journey with cancer. But I couldn’t have been more wrong if I tried. Today, over five years on, I’m cancer free. I wake up and I get to enjoy my days, I am excited about my future and I feel utterly blessed to have seen my girls start school, to have taken them on holidays and to being able to make their pack lunch for them. I also know that life is uncertain, it’s precious and each day matters so much. It has taken me all this time to recover from my breast cancer diagnosis. Physically and mentally, and on some days I know that I am still on a journey. When my conventional cancer treatment finished I fell into a deep hole. I was scared that my cancer would return. My anxiety resulted in panic attacks and physical pains which I couldn’t explain. I had lost all trust in my body. I just didn’t know what I should be feeling anymore. What was normal? I just wanted my old life back but I had no idea where to start. I just knew I had to do something. I needed to take control of my own recovery and wellbeing. I turned to food, changed my diet and I learned to cook. 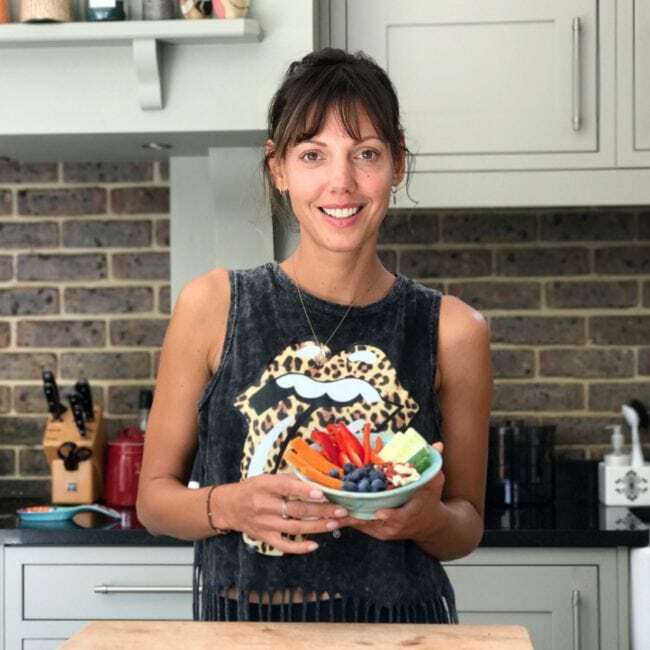 Initially I thought I had to cut out major food groups but I soon realised that I wanted to find not only a healthy but also a sustainable and enjoyable way of eating. So I started to focus my attention to all the wonderful foods that we are lucky enough to eat and I made our diets full-of, not free-from. At first my food was just healthy but now I get loads of compliments that it also tastes amazing! Which is just great! As a result my three girls eat really well too. Of course they have the occasional pizza and ice creams too but they do also eat quinoa, pulses and loads of veggies. It’s lovely that my way of eating has rubbed off on the whole family. At about the same time my mother in law ushered me to my first yoga class. I can’t tell you how big the relief was when I first stepped on my mat. I could focus on my present moment, without being worried about the future or having past events rushing through my mind. Yoga also helped me to physically rebuild my house, but it was really mentally that I experienced the biggest benefits. My lifestyle changes felt empowering. I felt that I was on the right track, but it still did take a long time to feel a sense of relief, to worry less and trust more. Something else happened that I still can’t quite explain. I stared to experience this urge, this drive, to be honest about my experiences, to talk about the down’s as much as the up’s, to share what’s happened. I think it’s so important to say when life is rubbish and not just pretend that we’ve got everything under control. It’s OK not to feel OK. I started a little blog where I share family friendly and healthy recipes and tips for a healthy lifestyle. I host supper clubs, and have since cooked with hundreds of women. I also teach yoga, run wonderful retreats and get to write articles for some press. Most recently I even put everything I have learned along the way and put it into an online plan, for other families to learn how to make simple and healthy changes too. Throughout, my husband has been incredibly encouraging and we both have this strong sensation that we need to get on and do things. That life is wonderfully precious and it is there to be experienced fully. He even became an inventor! When my hair was growing back after chemotherapy, it inspired him to invent and manufacture a new hairbrush. The Manta, which he has launched at the beginning of the year. We both know, that we can’t wait for anything. That certain things need to be said daily. Such as ‘I love you’ and ‘I’m sorry’. This is the biggest gift I can pass onto my children. To be kind to themselves and kind to others. To appreciate the rain, to be grateful for the apple. To get on and do things, however big or small they may seem. To see each day as a gift. Previous Post 10 Creative Summer Holiday activities to boost your families wellbeing Next Post My diet changed my life! I think it’s amazing how you have turned it into a positive experience, making you more aware of living in the moment, an amazing role model for your daughters and other mums like me! Parenting is a challenge but if you can be someone they look up to then you are winning, that’s what I strive for.